The German economy is showing clear signs of weakening. GDP declined by 0.2 per cent in the second quarter of 2014 and German business sentiment fell for a fifth straight month in September to its lowest level in 17 months. Manufacturing orders dropped during August to the lowest level since May 2013. Germany’s problems will remain and get worse. Much of the resilience of the German economy during the last years can be attributed to harsh labour market and social security reforms. These were introduced by the Social Democrat Chancellor Gerhard Schroder (1998-2005) in 2003 with his ‘Agenda 2010’. The new centre-right / centre-left coalition led by Chancellor Angela Merkel has rolled back many of these reforms by reintroducing early retirement, granting extra pensions for mothers and installing an unprecedented legal minimum wage - of 8.50 euros per hour - in all sectors and all regions of Germany. 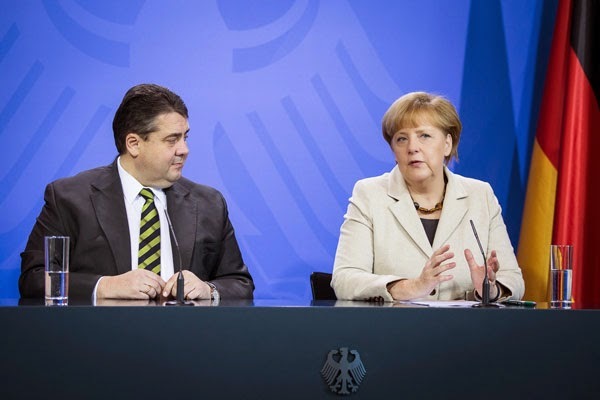 The German government has been forced to admit that the minimum wage will increase labour costs by 10 billion euros. It is still unclear how many jobs will be lost after its introduction in 2015. The new pension benefits will cost around 200 billion euros until 2030. Early retirement could take up to 250,000 elderly off the job market over the coming years when skilled and experienced labour is becoming increasingly scarce and valuable. Demographic decline will be Germany’s greatest challenge in the long run: coming decades could see Germany’s workforce shrink by about 200,000 every year. The old age dependency ratio - between those older than 65 and those of working age - could increase from 31 per cent in 2013 to 57 per cent in 2045. Immigration to boost the workforce would be essential. Experts calculate that net-migration of around 400,000 people a year - preferably young and educated - would be needed to avoid demographic decline. So where should Germany’s future economic growth, desperately needed to pay for pensions and somehow to rescue the eurozone, come from? The answer is from productivity and innovation, in short: smart investment. Labour participation rates, labour productivity and entrepreneurial ingenuity would have to increase dramatically. However, Germany’s productivity growth is lagging behind almost all other economies in the world. The established German Mittelstand - its economic backbone of small and medium-sized enterprises - and some big exporting firms, are still good at innovation. However, Germany holds a dismal 111th place in the World Bank’s ranking for ‘ease of starting a business’ and its service sector is under-developed and over-regulated, while Germany’s education system fails to produce enough matching skills. Germany’s capital stock is depreciating faster than new investments are replacing it. A declining capital stock combined with a declining workforce, leaves no hope for a growing economy. That does not mean Germany’s government must add more public debt to the mix. Many observers are demanding that the government abandons its ‘austerity obsession’ and take advantage of the historically low interest rates for more debt-financed ‘stimulus’. But the Merkel government is still in the position to do the right thing and increase investment without abandoning the new constitutional balanced budget rule. German politics should also provide better regulatory and tax environments for private domestic investment and lower barriers to entry for its service sector. Domestic industrial investment is also increasingly discouraged by the ‘lonely revolution’ to wean Germany off both fossil and nuclear energy. This policy may cost consumers, taxpayers and business up to one trillion euros over the next two decades, according to Peter Altmaier, the former minister for the environment, who is now chief of the Chancellery and minister for special affairs. German energy costs are now more than double those in the US, while Germany’s greenhouse emissions have increased. German entrepreneurs and foreign investors have always had these negative factors on their radar. Germany’s problem is not austerity, but demography and complacency. The message is you cannot bank on Germany. The problem now is that not enough people have paid work so the some time in the unspecified future expected shortage of workers seem like a strange thing to be worrying about now. Now we need to deal with the current problem unemployment i.e. NOT making the current problem worse. Companies not paying tax complaining about not getting benefits? Complacency is an issue in most countries. Longer paid vacations would put more money into consumers pockets but the ruling class consisting of workaholics can't fathom that most people only work to live and wouldn't mind getting more time off work. The result is the same failed policies - looking at this as a supply problem when it is a demand problem. So basically you are advising the Germans that they need to increase the population of Germany by 12 million over the next 30 years, by the mass importation of non-Germans to the extent of 0.4 million a year, "preferably young and educated", and no doubt each of those equipped with an ample supply of the elixir of youth, OVER AND ABOVE the number of Germans who give up on their own country and leave it each year. So that would be AT LEAST 15% of the present population of Germany replaced by non-Germans by the end of that process of social and ethnic engineering intended to get those governing Germany out of a financial hole of their making; but are you sure that would be enough, are you sure that you wouldn't want a more complete replacement? Pity that there's now no way to consult Brecht on whether this would really be "The Solution". Germany certainly has made a lot of mistakes, as this article points out. But the article does not discuss the pernicious influence of the euro as one source of the loss of German capital. The ECB prints euros to prop up unsustainable welfare states in the rest of Europe. Then German industry produces goods that these welfare states buy. All Germany gets out to the deal is an increase in the Bundesbank's balance at the ECB--there is no quid pro quo; i.e., Germany does not get real goods in exchange for the real goods that it exports. This is lost on almost every politician in Europe, including Merkel. I do believe that some German politicians and the Bundesbank understand what is happening, though. bureaucrats would never admit that they might be at fault. As the article points out, the issue here is demographics, not policy, As your population ages, and especially if younger cohorts shrink, certain policy choices are forced on you. If you don't increase benefits for retired workers, they will simply get sick earlier and more often, and you will pay the same or more through the healthcare system. If you don't establish a minimum wage, you won't attract the young foreign immigrants who help to make up the deficiencies in your demographics. Declining demographics put you into a policy "box". Your only choice is how to manage decline and which way to pay. There is no "magic" policy you can choose to defeat the fact that a higher number of economically inactive people need to be supported by a declining number of economically active workers. One from the Department of you could not make it up. The UK economy has performed so much better than the rest of the EU in the past five years that Brussels has now demanded an extra E2.1bn from the UK towards the EU budget. Meanwhile France, which has been hampered by excessive austerity, will get part of the money in a E500m refund. Well, now, we can't have that, can we? EU and Tory madness – but what has changed?